Sarah can’t sleep like a typical teenager. At night, she physically acts out her dreams, completely unaware that she is doing so. Being restrained to her bed every night is one way she copes, but after nearly killing a friend at a slumber party she becomes desperate. 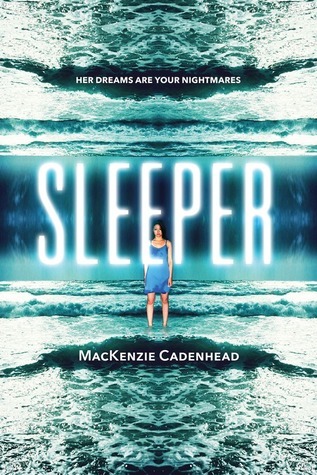 A promising new drug trial begins and she jumps at the chance to take part, but in addition to putting her to sleep and paralyzing her body, Sarah finds that she can insert herself into others’ dreams, as well as control their bodies while they sleep. When she realizes that Wes Nolan, the new guy at school, also shares her sleep disorder, they plot revenge on the classmates that are ostracizing them. I thought the premise of this book was interesting, but to me the characters felt one dimensional and overly stereotypical. There are several instances of bullying, drug use (including drugging unaware classmates), and various types of assault that, had these issues been covered differently rather than glossed over, maybe it wouldn’t have bothered me so much. The main character, Sarah, does learn and grow, which is the main redeeming quality, but for me it was too little too late. It was a suspenseful read which is what I was originally looking for, but definitely not my favorite.